Hidden in the shadows cast by willows, alders, and cottonwoods, a migrating female steelhead swam slowly upstream in the shallow waters of Pescadero Creek in the autumn of 1989. Before arriving at the creek, she had managed to migrate across the open seas from as far away as the Gulf of Alaska, locate her home stream, navigate through harbor seals and sea lions at the mouth of the creek, change her physiology to tolerate fresh water, and traverse the dangerous shallows of a fall coastal creek. Upstream, she located spawning gravels, prepared a nest called a redd, and laid many eggs where an entourage of smaller males could fertilize them. Completing the cycle, she then swam out to sea to prepare for another reproductive journey into Pescadero Creek the next year. While that female steelhead was making her journey upstream, I was busy with my first semester of teaching science classes at Pescadero High School. I became curious about the legendary steelhead that made their way through our campus and a short walk from my classroom. When my student Jose Barbosa invited me for a creek walk in the late afternoon to look for migrating steelhead, I jumped at the chance. With Jose as my guide, I first saw the large female mentioned above from the Butano Cutoff Bridge moving up stream on her way to spawn. Impressed by her size (at least 22″!) in the small confines of the creek, I immediately saw the potential of a captivating story. The steelhead migration could be the focus of a much larger narrative connecting the larger watershed and the open ocean beyond. Initiated by my first observation of this impressive migratory fish, I began contemplating a watershed-centered curriculum that would embrace our entire school district. 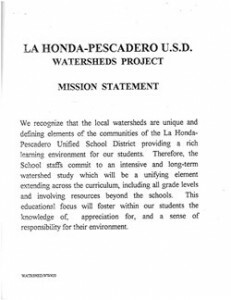 Shortly thereafter, a teacher at La Honda School and I applied for a grant from Apple, in which we outlined plans to develop of an integrated curriculum that would involve all the K-12 teachers within the La Honda-Pescadero Unified School District. We proposed beginning with high school students then broadening to include all students in the district. To our surprise and delight, Apple awarded the grant to us, one of only 24 nationwide. The grant included cash and computers worth nearly $200,000 and was spread over a three-year period. The magnitude of the grant, relative to the small school size, made it easier to get our staff, the students, and the community on board. Shortly after the grant success, we received permission from the California Department of Fish and Game to manage a state-approved trap along Pescadero Creek. With the help of fish biologist Dr. Jerry Smith from San Jose State University and Jennifer Nelson from California Fish and Game, the trap was installed. After the winter rains from 1992 to 1995, students manned the trap by measuring the lengths of the down-stream migrating juvenile (smolts) steelhead and any other fish that they captured in the trap. Results were passed on to state and federal agencies. 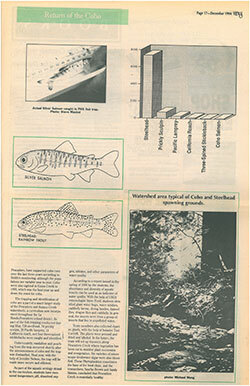 Page from the December 1994 cover story on the Watersheds Project in the now-defunct Views from the Coast newspaper, showing a photo of the watershed, drawings of the fish being tracked, and a graph of population distribution. From the outset, students were eager to participate in the project and quickly assumed leadership roles. One example stands out. Two students, Chuck Moore and Loren Hill, were assigned to service the trap on a Saturday morning. Midway through their shift, I received a call from Chuck that they had unexpectedly captured a coho salmon smolt in the trap. Since the species had not been seen in the creek for at least 10 years, this was big news. Until that moment, the possibility of seeing the fish seemed remote at best. I quickly drove to the high school to confirm what they had reported. After observing the young fish, I verified their identification, took some pictures, and forwarded them to Dr. Smith, who quickly confirmed the ID. In subsequent days, four more coho smolts were captured and identified. As word of our finding spread, the local community openly expressed sense of pride in the good work of our students. Chuck and Loren became local celebrities, interviewed by several newspapers, leaders in our research efforts, and among my most trusted student assistants. The fish trap captured the imagination of many of my students to a greater extent than anything within the regular science curriculum. The project seems to have had lasting effects on some students’ lives by influencing their educational and career choices. Coming up: the Watersheds Project expands district-wide! 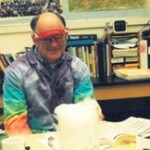 Steve Maskel is a retired science teacher who directed a celebrated Watershed Project at Pescadero High School from 1990-1997. This is the first of a series of blogs he is writing for Field Notes. You can read the rest of the series here: part 2, part 3, and part 4.